With Continuity, you can use a variety of features that let your Mac and other Apple devices that support Continuity — like iPhone, iPad, iPod touch and Apple Watch — work together in even smarter ways and let you seamlessly move between your devices. To use Continuity features, your devices must meet system requirements. See the Apple Support article System requirements for Continuity on Mac, iPhone, iPad, iPod touch and Apple Watch. Handoff lets you start a document, an email or a message on one device and pick up where you left off on another device. Handoff works with apps like Mail, Safari, Maps, Messages, Reminders, Calendar, Contacts, Pages, Numbers and Keynote. See Pick up where you left off with Handoff. Take a picture or scan a document with your nearby iPhone or iPad and have it appear instantly on your Mac. See Insert photos and scans with Continuity Camera. With Universal Clipboard, you can copy text, images, photos and videos on one Apple device and then paste the content on another Apple device. For example, you can copy a recipe from Safari on your Mac, then paste it into Notes on your nearby iPhone. See Copy and paste between devices from your Mac. Use your Apple Watch to unlock your Mac after waking it — instead of entering your password — so you can get right back to work. See Unlock your Mac with Apple Watch. When you want to make or answer a phone call, don’t reach for your iPhone — use your Mac. You can start calls from FaceTime, Contacts, Safari, Mail, Maps, Spotlight and many other apps. When someone calls you, a notification appears. Just click the notification to answer. See Make and receive phone calls in FaceTime. Send and receive SMS and MMS text messages right from your Mac. When friends text you, regardless of what phone they have, you can respond from whichever device is closest. 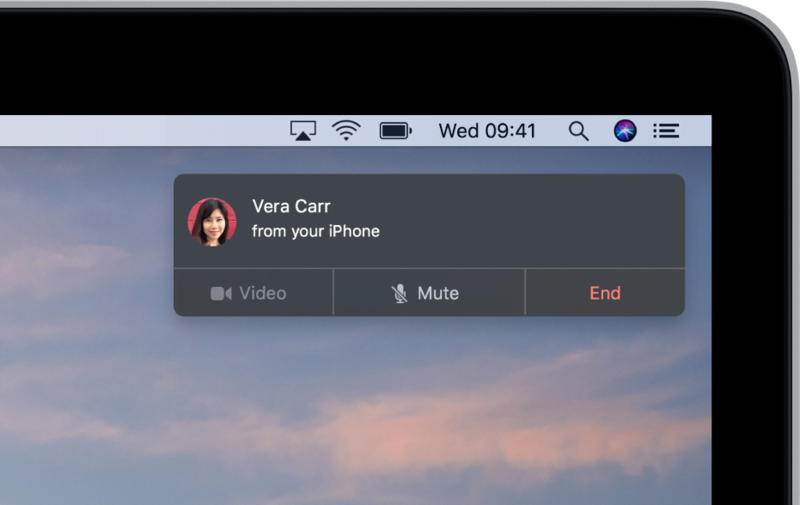 All the messages that appear on your iPhone now appear on your Mac, too. See Set up iPhone to get SMS texts. AirDrop lets you quickly share photos, videos, contacts and anything else, with anyone near you — wirelessly. It makes sharing to iPad, iPhone, iPod touch and Mac as simple as dragging and dropping. See Use AirDrop on your Mac to send files to devices near you. No Wi‑Fi? No problem. Your Mac can connect to the Internet using the personal hotspot on your iPhone or iPad when they’re within range of each other. No setup is required. Your iPhone or iPad automatically appears in the Wi‑Fi menu on your Mac — just select it to turn on your hotspot. See Use an iPhone or iPad to connect to the Internet.